Tornadoes are violent and powerful rotating columns of air that form under certain conditions, usually during the spring and summer months. 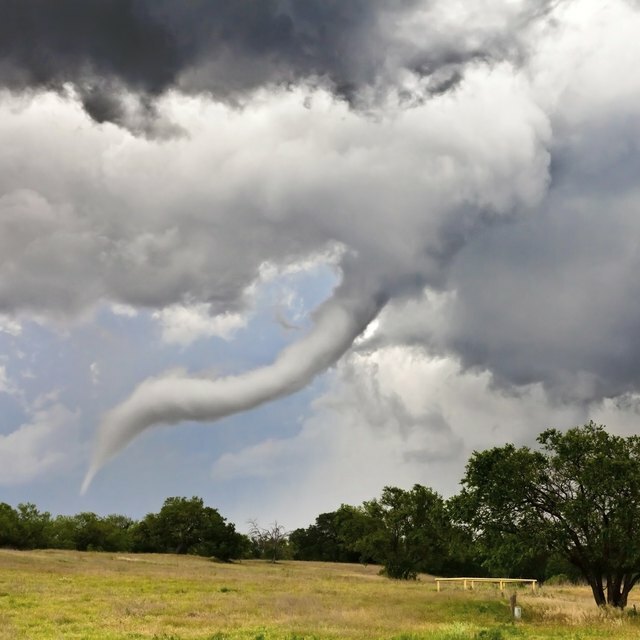 Typically, tornadoes form during thunderstorms, but occasionally they form during hurricanes and tropical storms. A tornado over water is called a waterspout. While real tornadoes are massively destructive, building a model of one is safe and easy. Making a model tornado is an ideal project for a young child who is studying weather patterns. Remove any labels from the plastic bottles. Clear 2-liter bottles of the same size work best. Fill one bottle 3/4 full of plain water. Add a few drops of food coloring to the water to make the "tornado" more visible. If desired, add glitter or confetti. For a whimsical approach, add some small plastic toys, like cars or houses. Turn the empty bottle upside down, and place it on top of the bottle with water so the mouths of each bottle match up. Tape the mouths together securely with duct tape. Make sure there are no leaks or the model will make a mess. Swirl the bottles, then turn them over so that the bottle filled with water is on top. Watch the "tornado" form as the top bottle drains into the bottom. Leggett, Rochelle. "How to Build a Model Tornado." Sciencing, https://sciencing.com/build-model-tornado-8444290.html. 24 April 2017.